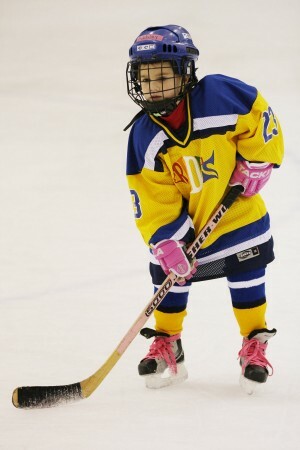 Oswego, NY – The Rudy’s Mite B Team captured two wins and a tie in recent action against Whitestown, Perinton, and Camillus, according to head coach Todd Donahue. Rudy’s beat a tough Whitestown team 5-2 at the Cullinan Ice Rink in Oswego. After falling behind 1-0 midway through the first period, Rudy’s Forward Aiden Caroccio got Oswego on the board at the 7:42 mark to tie the game. Whitestown took the lead again in the second period before Oswego scored the next 4 goals in the game to secure the win. Tyler O’Grady led the team in points with two goals and an assist, and Spencer Stepien also netted two goals. Caroccio also had an assist and Hunter Lawton assisted on one of O’Grady’s goals. Goalie Cole Cullinan played stellar in the net and recorded 17 saves in the win. In a rematch from a game earlier this season in which Perinton defeated Rudy’s 3-1, Oswego returned the favor in recent action on their home ice by winning 3-1 win. Rudy’s Defenseman Joe Diblasi found the net at 7:53 of the first period for the first goal of the game. Danny Donahue scored in the second period off an assist by Jeremy Susino to make it 2-0. Perinton scored at 6:13 in third period, before Spencer Stepien iced the game with a goal with 1:02 remaining off an assist by Tommy Back. Cole Cullinan recorded 6 saves in net for the win. 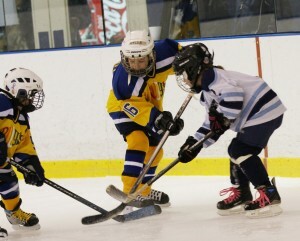 Camillus scored with just over a minute to go to tie the Rudy’s B Mites 2-2 in recent minor hockey action. Rudy’s jumped out to an early 2-0 lead off of goals by Marcus Baker and Tyler O’Grady, but the home Camillus squad battled back in the second and third periods to get the tie. Hunter Lawton had 23 saves in an outstanding performance in net, according to Donahue. Jeremy Susino added an assist in the game.